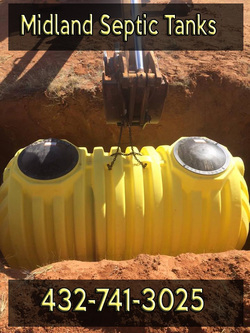 Midland Septic Tanks is the leading professionals in all of Midland and Ector Counties for all of your septic system and septic tank needs. We have a leading design team and work team that knows the septic business inside and out. Let us be your local professionals for all of your septic tank needs. Call us today at 432-741-3025. Midland Septic Tanks are the leading professionals that are educated and knowledgeable in all types of Septic Tanks and Systems. Trust us to serve all of your septic tank needs. Our professional service team is educated in all types of septic systems, work with you on your prices, and will give you service that will make you proud. Let our team show you why we are the leading professionals in all of Midland and Odessa. 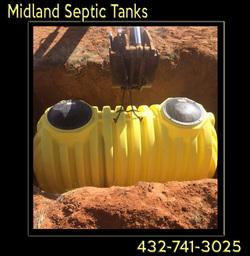 Midland Septic Tanks is part of the larger family business of Ark Construction. At Ark Construction, we can provide you with more than just Septic Tank Installation and Repairs. Call us at 432-741-3025 or fill out the form to find out how best we can help you. Ark Construction is located and operated in Midland. We proudly serve all of Midland and Odessa. We offer an extensive list of services. Call us to see how we can best serve you. Here is a list of just a few of our services that we can provide you: sheet rock repair, professional painting, flooring installation, artificial turf, faucet repair, plumbing, electrical, landscape, mowing, decks, patios, carports, roofing and shingles, demolition, property management, concrete side walks, patios, driveways, decorative concrete , stained concrete, and so much more. We are your one contractor stop for all your contractor needs. See something that doesn't fit your list.